So I might be bragging a little but hey, that's why I have my own blog! Making the grade is a feature article in California County and it includes me! 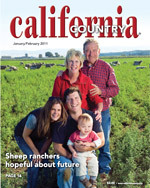 In the current issue of California Country, is a story about County Farm Bureau education programs. One of the three featured Farm Bureau's is Butte County - that would be my county! We have a really unique program called the Agribee™. The Agribee™ is a spell and define competition, like a traditional spelling bee only participants must spell and define the words to advance in the competition. The other really unique element is that each word is an agricultural word! If you are looking for a really great magazine all about California agriculture, check out California Country. A subscription is only $9!